German publicist and rabbi; born in Stanislau, Galicia, Jan. 6, 1860. His father, who was a good rabbinical scholar and also well versed in secular knowledge, was his first instructor. He took to writing Hebrew very early; and at the age of thirteen he translated a German novel into that tongue. 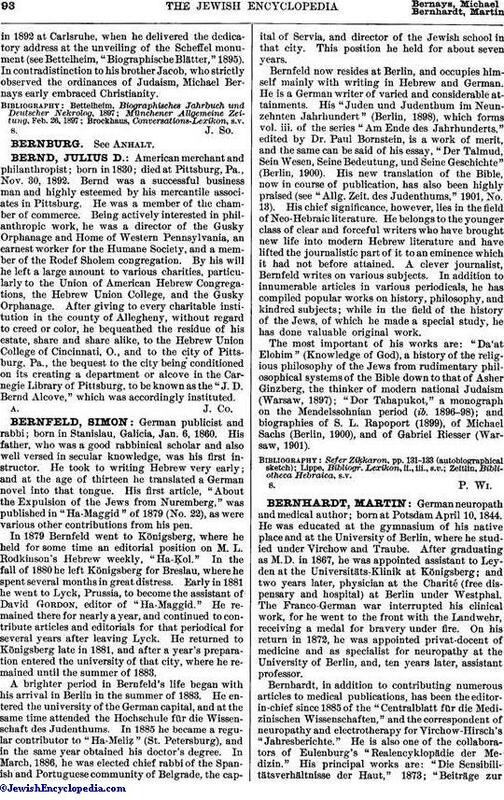 His first article, "About the Expulsion of the Jews from Nuremberg," was published in "Ha-Maggid" of 1879 (No. 22), as were various other contributions from his pen. In 1879 Bernfeld went to Königsberg, where he held for some time an editorial position on M. L. Rodkinson's Hebrew weekly, "Ha-Ḳol." In the fall of 1880 he left Königsberg for Breslau, where he spent several months in great distress. Early in 1881 he went to Lyck, Prussia, to become the assistant of David Gordon, editor of "Ha-Maggid." He remained there for nearly a year, and continued to contribute articles and editorials for that periodical for several years after leaving Lyck. He returned to Königsberg late in 1881, and after a year's preparation entered the university of that city, where he remained until the summer of 1883. A brighter period in Bernfeld's life began with his arrival in Berlin in the summer of 1883. He entered the university of the German capital, and at the same time attended the Hochschule für die Wissenschaft des Judenthums. In 1885 he became a regular contributor to "Ha-Meliẓ" (St. Petersburg), and in the same year obtained his doctor's degree. In March, 1886, he was elected chief rabbi of the Spanish and Portuguese community of Belgrade, the capital of Servia, and director of the Jewish school in that city. This position he held for about seven years. Bernfeld now resides at Berlin, and occupies himself mainly with writing in Hebrew and German. He is a German writer of varied and considerable attainments. His "Juden und Judenthum im Neunzehnten Jahrhundert" (Berlin, 1898), which forms vol. iii. of the series "Am Ende des Jahrhunderts," edited by Dr. Paul Bornstein, is a work of merit, and the same can be said of his essay, "Der Talmud, Sein Wesen, Seine Bedeutung, und Seine Geschichte" (Berlin, 1900). His new translation of the Bible, now in course of publication, has also been highly praised (see "Allg. Zeit. des Judenthums," 1901, No. 13). His chief significance, however, lies in the field of Neo-Hebraic literature. He belongs to the younger class of clear and forceful writers who have brought new life into modern Hebrew literature and have lifted the journalistic part of it to an eminence which it had not before attained. A clever journalist, Bernfeld writes on various subjects. In addition to innumerable articles in various periodicals, he has compiled popular works on history, philosophy, and kindred subjects; while in the field of the history of the Jews, of which he made a special study, he has done valuable original work. The most important of his works are: "Da'at Elohim" (Knowledge of God), a history of the religious philosophy of the Jews from rudimentary philosophical systems of the Bible down to that of Asher Ginzberg, the thinker of modern national Judaism (Warsaw, 1897); "Dor Tahapukot," a monograph on the Mendelssohnian period (ib. 1896-98); and biographies of S. L. Rapoport (1899), of Michael Sachs (Berlin, 1900), and of Gabriel Riesser (Warsaw, 1901).